Steelers Extend HC Tomlim’s Contract Through 2018 | "IT'S A STEELERS WORLD"! Seriously, is there any head coach in the National Football League more deserving? The Steelers announced today that they have agreed on a two-year contract extension for Head Coach Mike Tomlin that will keep him with the team through at least the 2018 season. Financial terms of the contract extension were not disclosed. 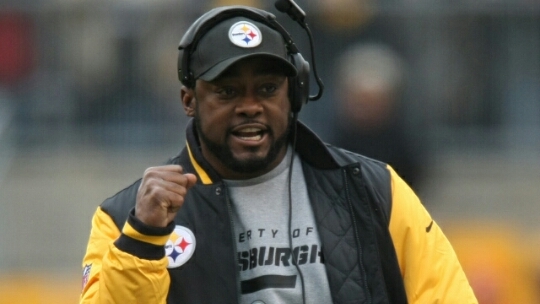 The 43-year-old Tomlin has gone 82-46 in the regular season in eight seasons as head coach, has been to the playoffs five times and became the youngest head coach in NFL history to both coach in and win a Super Bowl when he led the Steelers to a 27-23 victory over the Arizona Cardinals in Super Bowl XLIII. By winning the Super Bowl in only his second season as a head coach, he also became the fastest to win a Super Bowl title in Steelers’ history. And that’s what makes Tomlin a top notch NFL head coach. All business first..celebrate later. The mentality held by the two great Steelers coaches before him, and he has my utmost appreciation for that. Congratulations Mike Tomlin, you very much deserved your contract extension. And we are all happy to have you a part of Steelers Nation/Steelers World. Congratulations Coach Tomlin on a well deserved contract extension. You have been a wonderful part of the Steelers family and I’m glad to see you staying for awhile longer!! Very nice congratulatory reply, Deanna. It will be forwarded. Thank you! Thank you, Tiffany. I will be sure to forward your congratulations to coach Tomlin. And like you, I hope he remains a Steeler as well until he retires. Another Super Bowl will solidify that. Congratulations Coach, and to the Steelers – my best wishes for a SUPER season!! Well deserved for him to stay as the coach. Good for him. Hope for him have another good season. Thank you Derek. With .621 winning percentage, Tomlin has bested the previous two coaches. Still all three are great! Very well deserving. Reply will be forwarded. Congratulations Coach Tomlin, I am so proud and thankful to have you here!! Thanks to your wife and family for putting up with all of the long days and nights. Thanks to all of the players who work hard to be their best!! Hahaha! Excellent job, Melissa. Someone who understands that a coaches family is a big part of where that coach stays or goes. I will definitely forward this to Coach Tomlin. Thank you for your reply. Congrats Coach T! I sincerely hope you’ll coach the Steelers your entire career! We couldn’t have a better leader, motivator, personality and caretaker of the players! Thanks for all you’ve done and continue to do! Congrats Coach Tomlin you deserved it, You are a Steele you will give number 7 and a few more I do believe.